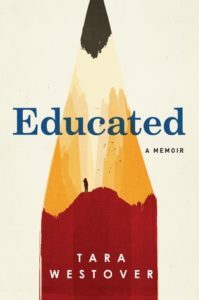 Educated is the memoir of Tara Westover who, despite being in her early thirties, really does have a story to tell. My mother read this in her book group this past fall and raved about it to me, so much so that I bought it immediately on my kindle. I started reading it about week ago, and was immediately mesmerized. The prose in this book is compelling and hypnotically readable. I’ve been sitting on this book for a week trying to figure out how to review it beyond just saying “OMG READ THIS BOOK” (which I may or may not have been doing at work, oops). I have a lot of thoughts about the book, don’t get me wrong, but they’re about how Westover chose to compile her memoirs, including things she left out, and not so much about the book and why you (yes you) should read it. The book follows Westover’s life from early childhood through her post-graduate degrees and is mainly about her relationship with her family. Her family, and their attitudes about women, education, the government, religion, and the end of days were the mountain that Westover had to climb over in order to educate herself. She had no formal classroom training until her first day of college at Brigham Young University in Provo, UT and a lot of the book is dedicated to the struggles of learning in an environment that doesn’t appreciate formal education. While I do use the shorthand “she was raised in a fundamentalist Mormon household and got out” to describe the book, that description isn’t completely accurate. Although Westover deliberately removed a lot of Mormon markers from the book (as many as she could without changing the story), my reading of the book put her family as members of the mainstream Latter Day Saint Church headquartered in Salt Lake City. Though there are many fundamentalist Mormon offshoots, Westover wasn’t raised in a Warren Jeffs type polygamist compound. Her family may have been ‘home schooled’ (and they definitely took a lot of the church’s teachings to an extreme), but they grew up in the same church that I did. The idea of having a year’s worth of food storage was very common in the mid-80s and 90s, and I’m guessing it’s still something that’s brought up every once in a while. That the Westover family took it to an extreme is an important point, but nevertheless, I can’t say it was a fundamentalist family without qualifications. Honestly, the removal of Mormon elements was something I found fascinating in the book. They aren’t removed completely, Westover couldn’t have told an honest story about growing up and going to BYU without some Mormon elements, but the ones she chose to remove fascinate me. I’m positive her brothers all served two year missions, she only mentions her father’s, but she talks about her older brother ‘coming back’ and I wondered if it was from his mission? Her father’s rants on various subjects, how tied were they to General Conference? This is a bi-yearly meeting where the leaders in SLC give sermons to members, it’s filmed and broadcast around the globe. It is also four to six sessions (four general and then one for men and one for women), each one two hours long. And while Westover mentions her father preaching to other members of her congregation, I wonder did that happen during Fast and Testimony meeting? I’ll eat my shoes if it didn’t. I find it interesting that Westover removed the Mormon elements in order to make it more relatable to the general public, and yet it creates a kind of cultural gap in her story. It’s not something that people unfamiliar with the Mormon church would recognize, but once I thought about them I found them very obvious. Related to this, I found it fascinating that in a book which deals heavily with memory and how mutable it is Westover would choose to paraphrase letters and emails instead of quoting them. Whenever she mentions a correspondence, she never quotes it directly, instead she summarizes it. She doesn’t hid this, after each chapter where there is such a summation, there’s a small note that lets the reader know this is not an exact quote but that the meaning has been maintained. This does raise the question though, whose meaning? Is it the intended meaning of the writer? Or is it the meaning that Westover gleaned from it? And if it’s the latter, is it the interpretation of Westover at the time the letter was received or the Westover who is writing this memoir and trying to put together the pieces of her life into a coherent story. Like I said, it’s an interesting technique to use in a memoir that delves into unreliable memories and how memories can change us. I also find it a fascinating technique from a historian. In a way, it is Westover’s way of claiming her memoir as the final word on her life, there are no other interpretations that matter. By denying the reader the actual words in those letters and emails, Westover is staking her claim as a primary source. This is her life, and no one else’s words on her life matter. For a woman who has struggled to get to that point, it’s a strong statement. Anyway, if you’ve gotten through this, thank you for reading. If you skipped down to the end in hopes of getting a summation, I’m afraid the only thing I have to offer you is OMG GO READ THIS BOOK. Share the post "Everything I had worked for, all my years of study, had been to purchase for myself this one privilege: to see and experience more truths than those given to me by my father, and to use those truths to construct my own mind." I like this. I found it fascinating how the whole way through the book she was constantly questioning her own memories, and the memories of the people around her who experienced the same events. I interpreted as her way of making sense of reality, which she also questions when she has her breakdown. But I like this way of looking at it, too. Thank you. The whole book was so fascinating to me, but the construction of it, and how Westover chose to tell her story is probably the most fascinating. I do think I’ll be revisiting this book at some point, which isn’t something I can say about a lot of books. This is a great review, and picks up on things that I would definitely have missed. Thanks! It’s such an interesting book to me, as I’m familiar enough with some of the background and yet it is still so foreign to my experience with that same background. I’d be interested in hearing how others who were raised Mormon (whether they’re still active or, like me, not so much) feel about it.